The Monthly Calendar is accessed by pointing to Classes in the menu bar and clicking Monthly Calendar. Use the Category 1 drop down and / or the Session drop down to filter the results. Check the Show Instructors checkbox to show instructor names with classes. Select a month by clicking Previous Month / Next Month or the the Month / Year drop down. Click any Class Name to display the Class page. Classes are listed in the following format: Class Start Time, Class Name, (# Openings). Hover over a class to open a small summary pop-up with Class Name, Start/End Times, Current Size, Current Openings, Current Wait List #, Start / End Dates, Instructor's Name, Meeting Day, Class Fee. 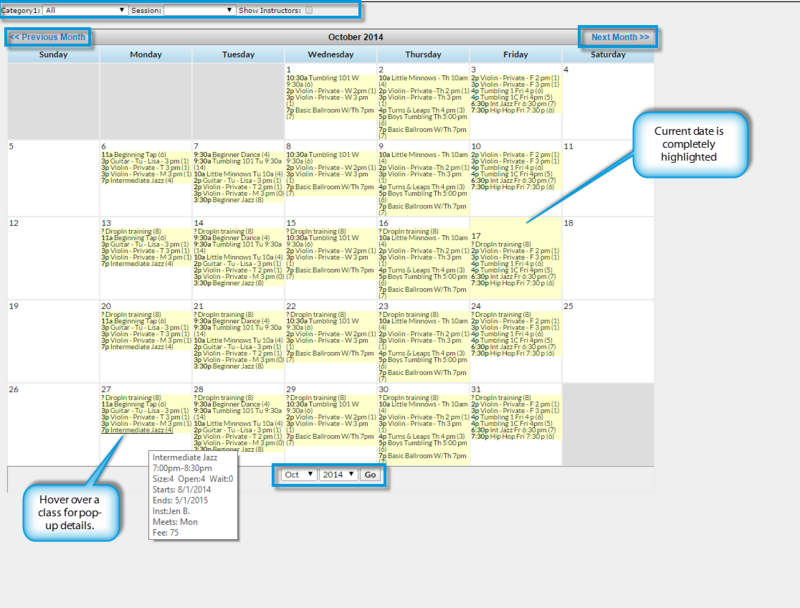 Print the Monthly Schedule Calendar by clicking the Print link in the upper right corner of the screen.